Title: Isolation and characterization of proteins Aims: This experiment was carried out to separate and characterize the protein mixture which contained haemoglobin and serum albumin using two different methods, SDS-polyacrylamide gel electrophoresis (SDS-page) and ion exchange chromatography (IEC). The principles on the operation mode of SDS-page and IEC were studied. Besides that, the comparison of DEAE and CM column of IEC on separating proteins was made. The experiment was also carried out to determine the percentage recovery of proteins. 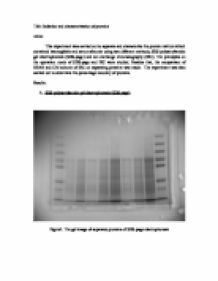 Results: A. SDS-polyacrylamide gel electrophoresis (SDS-page) Figure1. The gel image of separated proteins of SDS-page electrophoresis Table1. The distance travelled for each molecular weight of separated proteins in standard marker in SDS-page gel Molecular weight of proteins in standard marker, kDa Logarithm of molecular weight of proteins in standard marker, kDa Distance migrated by each protein, cm 250 2.40 2.0 130 2.11 2.8 100 2.00 3.6 70 1.85 4.5 55 1.74 5.1 35 1.54 6.7 25 1.40 7.5 15 1.18 8.6 Figure2. The graph of distance travelled by separated proteins, cm against the logarithm of molecular weight of proteins, kDa Table2. The distance travelled for each molecular weight of proteins in SDS-page gel Distance migrated by each protein, cm Logarithm of molecular weight of proteins in standard marker, kDa Molecular weight of proteins in standard marker, kDa 4.5 1.88 75.83 8.7 1.16 14.35 Calculations The molecular weight of protein From figure 2, it was shown that the relationship between the distance travelled by the separated protein of the standard marker and their molecular weight can be illustrated using the formula, y = -5.809 (log x) + 15.42 with R2 = 0.983. Distance of fragment travelled from well = 4.5cm y = -5.809(log x) + 15.42 4.5 = -5.809 (log x) + 15.42 Log x = 1.88kDa X = 75.83kDa This calculation was repeated for all the separated protein of protein mixture and the results were tabulated in table 2. ...read more. original sample was added to the column, mass of serum albumin in undiluted protein sample = = 3350 �g *This calculation was repeated for both samples of DEAE and CM column. The results were tabulated in table 10. Percentage recovery of serum albumin Percentage recovery of serum albumin = x100% = 84.03% *This calculation was repeated for both DEAE and CM column. The results were tabulated in table 10. Discussion: For the separation of protein mixture using ion exchange chromatography, it can be seen that both the elution profiles obtained in determination of haemoglobin and serum albumin, peaks are observed for both DEAE and CM column. The peaks for determination of haemoglobin using DEAE and serum albumin using DEAE and CM appeared to be in the middle of the test tubes which are among test tubes 5 and 6. This is because at the beginning of the experiment, the protein mixture was just added into the column. The time taken for the protein mixture to sip inside the column is shorter which resulted in some of the proteins were still above the column and not fully sip in the column. When the chromatography started, the first few test tubes contained only low amount of protein separated as only little amount of protein sip into the column. After a short period of time, more protein will be separate by the column as the pressure caused the protein mixture to flow down. It can be observed that for the last few test tubes, the amount of protein being collected was lower due to the reason that most of the proteins were separated by the column and fewer amounts of proteins were left. However, for the determination of haemoglobin using CM column, the peak of the elution profile was slightly skewed to the left which indicated that more separated protein was collected in test tubes 2 and 3. ...read more. or � individual protein subunits which were smaller in size and serum albumin being larger. The small differences of the experimental results and the theoretical result may due to parallax errors in measuring the distance migrated. Dilutions of the protein mixture with different dilution factors were done. This was done to act as a comparison in order to make sure that the numbers of bands and distance migrated was accurate. It was shown that the distance migrated by each protein for each dilution was about the same. This indicated that the results were accurate and consistent. Standard marker was used as a reference in determining the distance migrated by each protein band. Theoretically, there should be 9 protein bands of standard marker separated by the SDS-page. However, there were only 8 protein bands observed. This may due o the incomplete reaction of the SDS detergent in denaturing protein, causing the SDS-protein complex to be unable to form as SDS detergent was not able to bind to the hydrophobic region of protein. Besides that, it may also due to the length of the gel was not long enough, causing one of the band to be eluted out from the gel. Another reason was that the electrophoresis may take too long time and resulted in elution of last protein band. Conclusion: In conclusion, the recovery percentage of haemoglobin using DEAE and CM column were 18.79% and 73.54% respectively. As for the determination of serum albumin, the recovery percentage of DEAE and CM column were 84.03% and 106.43% respectively. This showed that CM is more efficient than DEAE in separating proteins. Exceeding of 100% recovery percentage may due to contamination of impurities. For SDS-page, the serum albumin has molecular size of 75.83kDa and haemoglobin has size of 14.35kDa. Shortage of one protein band of standard marker may due to too long period of running gel and the gel was tooshort causing the bands to be eluted out. The isoelectric points of haemoglobin and serum albumin were higher than pH6 and lower than pH6 respectively. ...read more. This student written piece of work is one of many that can be found in our University Degree Applied Biology section. the bottoms of the wells could be noted, then it was removed. The gel was completed by adding the APS and TEMED, and the solution mixed well, without shaking to avoid air bubbles being created which would destroy the gel. Food Science -Experiments to Determine the Properties and Uses of Enzymes in Food Preperation. Column kit and incorporating chaotropic reagents and lysing matrices of protocols were better than standard phenol-chloroform (PC) extraction protocols for DNA isolation from three medically important fungi;Candida, yeast, and mushroom. The integrity and quality of the extracted genomic DNA were further validated by spectrophotometric detection (Ahn et al.